I run a few photo blogs on Tumblr. I also follow a variety of similar blogs. 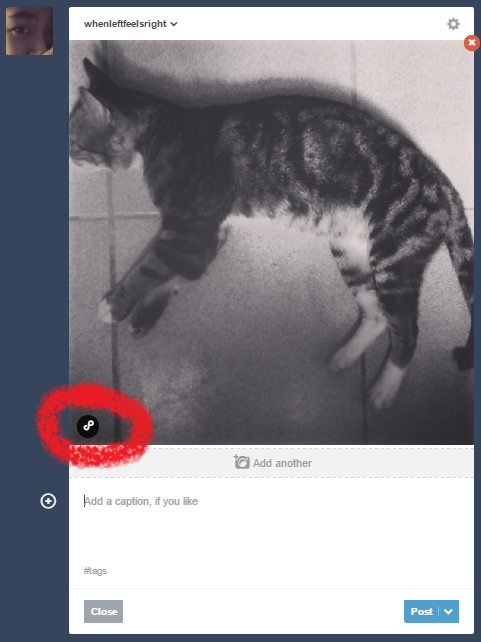 I have noticed that when I click certain photo posts, the images open inside Tumblr as Lightboxes. But sometimes, the permalink page of the post is opened in a new page. Is there any specific option that I can turn on the same for my blogs ? So far I have only been able to add permalink to photo caption only. Add your desired link on the space provided once you click on that button. If you want to use the photo's permalink, upload the photo first, then get the permalink, and add the permalink on that button. If you don't want to do those tedious stuff, set your permalink in the gear at top right, and use the link you've created. Not the answer you're looking for? Browse other questions tagged tumblr links blog photos or ask your own question.